The German-speaking part of Switzerland is shown in orange on this map of Languages of Switzerland. Distribution of High Alemannic dialects. Marked in red is the Brünig-Napf-Reuss line. Distribution of Highest Alemannic dialects. 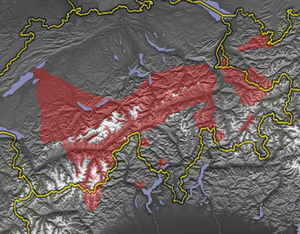 The German-speaking part of Switzerland (German: Deutschschweiz, French: Suisse alémanique, Italian: Svizzera tedesca, Romansh: Svizra tudestga) comprises about 65 percent of Switzerland (North Western Switzerland, Eastern Switzerland, Central Switzerland, most of the Swiss plateau and the greater part of the Swiss Alps). 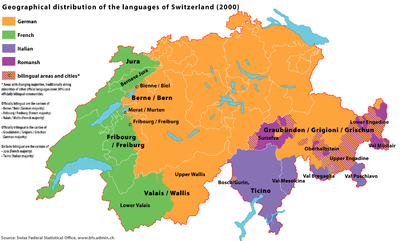 In 17 Swiss cantons, German is the only official language (Aargau, Appenzell Ausserrhoden, Appenzell Innerrhoden, Basel-Stadt, Basel-Landschaft, Glarus, Lucerne, Nidwalden, Obwalden, Schaffhausen, Schwyz, Solothurn, St. Gallen, Thurgau, Uri, Zug, Zurich). In the cantons of Bern, Fribourg and Valais, French is co-official; in the trilingual canton of Graubünden, more than half of the population speaks German, while the rest speak Romansh or Italian. In each case, all languages are official languages of the respective canton. 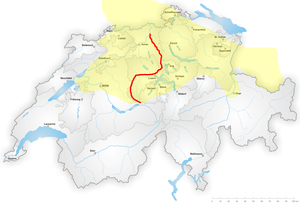 While the French-speaking Swiss prefer to call themselves Romands and their part of the country la Romandie, the German-speaking Swiss used to refer to (and, colloquially, still do) the French-speaking Swiss as "Welsche", and to their area as Welschland, which has the same etymology as the English Welsh (see Walha). In Germany Welsch and Welschland refer to Italy; there, the term is antiquated, rarely used, and somewhat disparaging. By the Middle Ages, a marked difference had developed between the rural cantons of the German-speaking part of Switzerland and the city cantons, divided by views about trade and commerce. After the Reformation, all cantons were either Catholic or Protestant, and the denominational influences on culture added to the differences. Even today, where all cantons are somewhat denominationally mixed, the different historical denominations can be seen in the mountain villages, where Roman Catholic Central Switzerland abounds with chapels and statues of saints, and the farm houses in the very similar landscape of the Protestant Bernese Oberland show Bible verses carved on the housefronts, instead. ↑ "The Federal Constitution of the Swiss Confederation, article 1". Retrieved 2009-05-01.